The world’s longest suspension bridges are measured and compared using the clear span of unsupported road or distance between bridge towers. Commonly and for engineering reasons span distances are correlated to the height of their towers and the complexity of their design and construction. Let’s get on this journey to discover these amazing constructions. 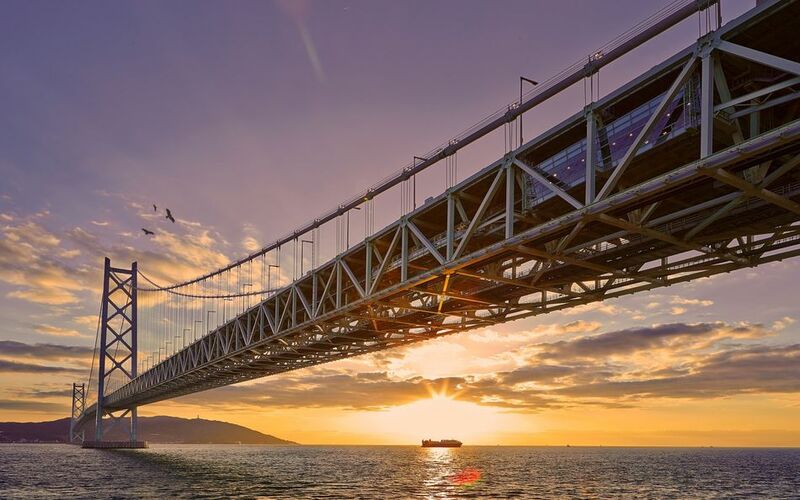 Also known as Pearl Bridge, this is a suspension bridge in Japan that crosses the Akashi Strait linking Maiko in Kobe and Iwaya in Awaji town on Awaji Island. With 1991 meters or 6,523 feet of ​unsupported span, it’s the longest suspension bridge or unsupported span on a bridge in the Earth. Also known as the Pearl Bridge, is located in Japan and its construction was finished around 1998. It serves as a connection between the city of Kobe and Awaji Island, going over the famous Akashi Strait. This suspension bridge was designed with a two-hinged stiffening girder system, allowing the structure to withstand winds of 178 mph and earthquakes measuring to 8.5 on the Richter scale. To attend the damp forces exerted on the Akashi Kaikyō bridge it has a pendulum system that operates at the resonance frequency. The two main towers of the Akashi Kaikyō are 978 ft over sea level, and due to its design, the suspension bridge can expand up to 7 ft due to heating of the structure. It was designed by Honshu Shikoku Bridge Authority. Built on the Zhoushan Archipelago, this bridge was completed in December 2007 but open to the public December of 2009. It has an unsupported length of 5,413 feet, and its cost was up to $363 million. It links the Jintang and Cezi Islands. It was built by Dorman Long Technology Limited. Located between the islands of Funen and Zealand, this great suspension bridge has an unsupported length of 5,328 feet. It was designed by the Danish architectural practice Dissing+Weitling. The link replaces the ferry service which had been the primary means of crossing the Great Belt. It was built during the 1991-1998 period, and E. Pihl & Søn A.S. was the general contractor in this bridge. This bridge crosses the Yangtze River in Jiangsu Province, China. It consists of two major bridges that link Zhenjiang on the south of the river and Yangzhou on the north. The bridge forms part of the Beijing-Shanghai Expressway. Its longest span has 4,890 feet between columns. The towers are 705 ft above water level, and the main span of the bridge consists of an orthotropic steel box girder that is 10 feet in depth. The deck width is 129 feet. The contractors for this project were China Road and Bridge Co. and Dorman Long Technology Limited. Located near Kingston upon Hull in England, it spans between Barton-upon-Humber on the south bank and Hessle on the north bank, connecting the East Riding of Yorkshire and North Lincolnshire. The consulting engineers for the project were Freeman Fox & Partners, and the contractor was Sir William Arrol & Co. It has an unsupported span length of 4,626 feet. The towers are hollow vertical concrete columns, each 510 ft tall and the bridge is designed to tolerate constant motion and bends more than 10 ft in winds of 80 miles per hour. There is almost enough wire in the suspension cables to circle the Earth twice. It was considered the longest suspension bridge from 1981 to 1997.